Do you want to learn how to communicate with your Divine helpers? The angels say we all come to earth with a “built-in phone line to home.” For many, we lose our memory of how to call home, or we become fearful about communicating with the Divine. We can unconsciously block the very messages and guidance we so desire. This all-day workshop is designed by the angels to help you remove obstacles in receiving clear communication and guidance from your angels and heavenly loved ones. We’ll first identify your spiritual team and learn the many ways they send messages. You will explore your own intuitive channels and learn techniques to enhance all your senses, as well as manage interference. You'll discover ways to build a strong foundation based on your own beliefs, connect with the non-physical and give angel readings for yourself and others. Your angels want you to enjoy peace and joy. They want to talk to you and help you. Invest a day in learning how to use your phone! COST: $95.00 - Includes deck of angel oracle cards. Artwork by Howard David Johnson. 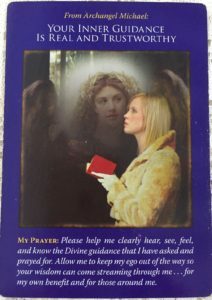 Archangel Michael Oracle Cards by Doreen Virtue.